We have two East Malatka Holly bushes in our flowerbed, which were only planted 5 months ago (they were in 15 gal pots, so already pretty large). They have been doing well, until just the last week or two, when one of them has developed a large brown patch of dead leaves. I'm in Houston, Texas, and we've had temps north of 100 degrees for the last couple of weeks. I'm not sure if this is the cause, or something else. I'm watering about 5 times a week. These beds have a drip system. The rest of the plants seems healthy and happy so it doesn't seem like it's over or under-watering. We've had issues in these spots, though. We've gone through two sets of pyramid boxwoods in the same spots which exhibited similar issues. Can anyone point me to what I should do, or look for, to diagnose the issue? Ok, I've done more investigation and watched how it's changing over time. Hopefully these will be enough to help diagnose. I think the small white spots and black branch must be evidence of something - I just have no knowledge in this area. UPDATE 2: I just pruned off the dead branches. I noticed the other bush has a brown patch as well. I pruned it off and noticed the green leaves remaining on that branch had a TON of the small white things on it, with some slight cottony webbing/tent-like stuff on the leaves. It looks to me like some sort of larvae. I was actually planning to spray the house perimeter for bugs tonight, so I've gone ahead and given the plants a good dousing with a Suspend SC suspension. We will see if that helps! 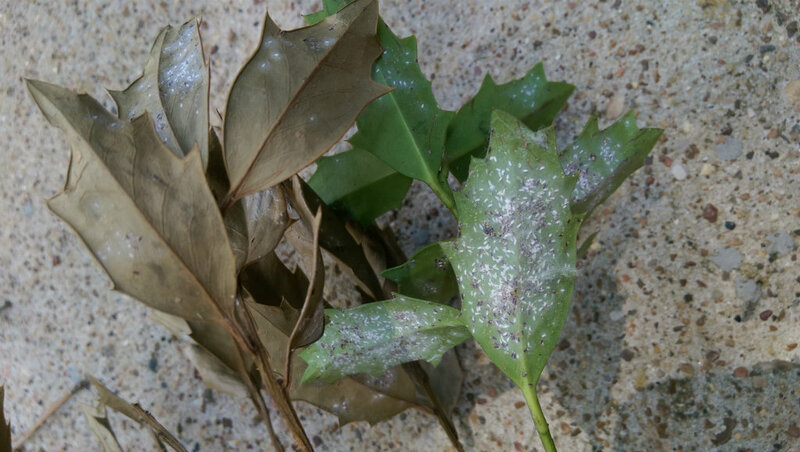 The pattern appears to be that these bugs (whatever they are) appear on the backs of the leaves. The leaf begins to turn brown/black around the eggs (or whatever they are). Next the whole leaf, then the stem and turns brown/black. The rest of the plant looks pretty healthy. Since the dead part appears to go straight down, I'd say it's either a single branch hooking in near the base of the tree, or else an offshoot. Either way, it could be transplant shock or an infected branch. While I don't live in Texas, we deal with similar temps in SC. I've planted several things this year and haven't had many issues. It looks like that might be mulch under the tree, so that's a good thing. Mulch is very important in not only holding liquid, but controlling temperature differences. It's like a buffer that gives you leeway in your care, so that it doesn't dry out and die or bake the roots before you can get to it. Watering 5 times a week seems excessive to me. I live in clay country, so my experience may be somewhat different than what you're experiencing in Texas, but I typically water about 1.25 gal of water a week if it doesn't rain, for the first summer, then only if it's especially hot and dry after that. I water that amount, because it's close to correct for most of my trees and I have a 2.5gal mop bucket I can easily use. After 4 days of no rain, my ground can get so dry it cracks, but if I pull back the mulch, like when I add fertilizer to established trees/bushes, the ground is damp under it. Even the cracked yard is damp down a few inches, so it doesn't need as much water as you think. 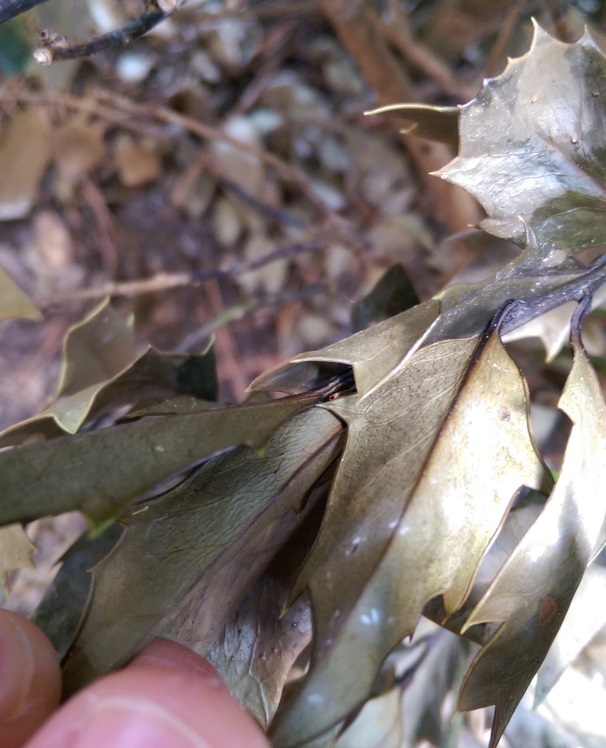 Also, you don't want your plant to drown in the excess water and it can also cause infections that can kill section or whole plants, like seen here. I did the same thing with a rhododendron. I mulched it in and watered it like the others and I believe this caused a rot to form in the roots that killed it. This year, I cut back on the water and didn't mulch. The ground around the base is dry and cracked, but the plant has put off two new shoots. I'd take off the dead material to prevent infection and cut back on the watering. There is a chart somewhere on the internet that tells you roughly how much to water for your area. I think it's mainly for gardens, but should be helpful with judging how much to water your tree. It had the base amount as 1" of water, but had a map with an additional amount of inches of water you add to that based on where you live, so for SC it was the base of 1", plus an additional 1" for my area. Look like 'flagging' to me...or a symptom of a virus that is not cool, sorry. Read this to see if this means anything to you. You might have to remove the whole plant and solarize the soil. You do not want to plant anything similar to boxwood or holly. Junipers as well. Check this out and other sites about VW and let us know what you decide to do!! Ok, I took a snipping to a local nursery. 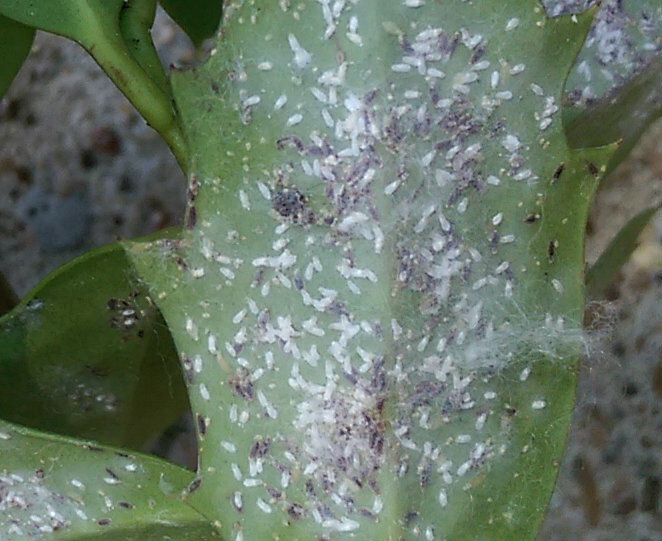 The bugs are white aphids. They sold me a systemic pesticide to use to treat the infestation. Hopefully that will do the trick! UPDATE (Final): We sent a cutting off to a lab for analysis. It's actually Euonymus scale. 9 months later, the plant is still alive but the scale is still present. People are correct when they say it's impossible to get rid of! Not the answer you're looking for? Browse other questions tagged diagnosis plant-health shrubs or ask your own question. 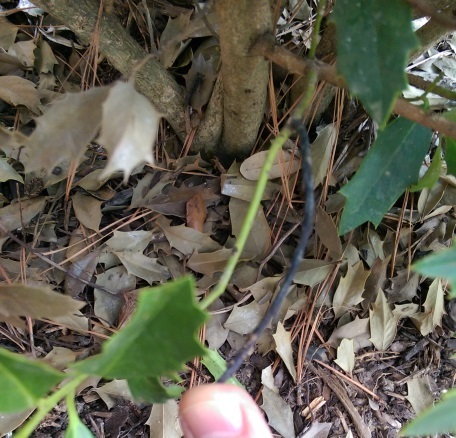 What can cause the leaves of a rose bush to turn black and fall off? 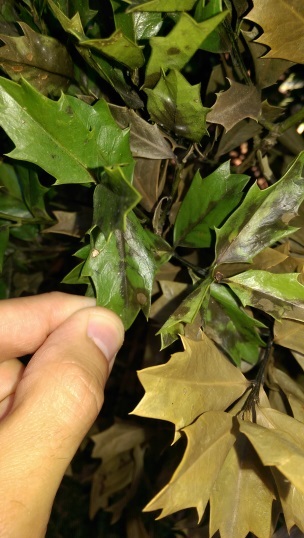 Why does my blueberry bush have brown/scorched leaves? Why is my pear tree dying around the blossoms? 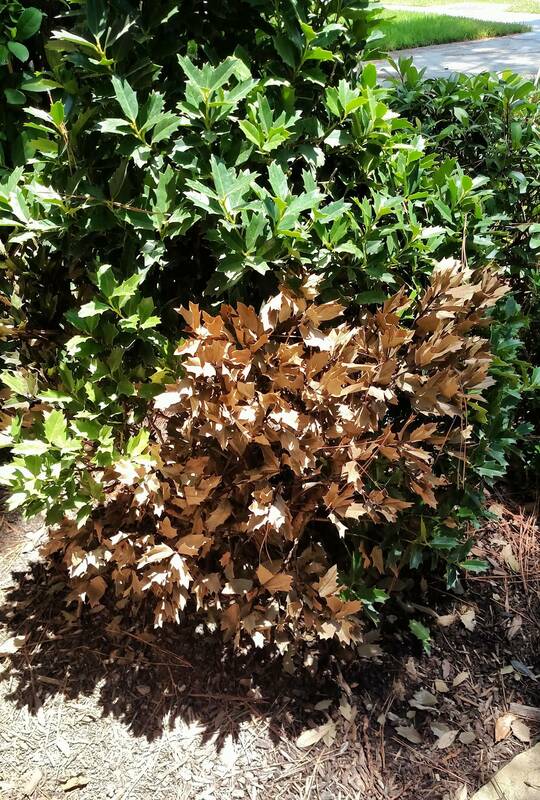 How can I help a rhododendron with yellowing leaves and a dead section? How should I treat a weigela bush with a large section of dead branches? 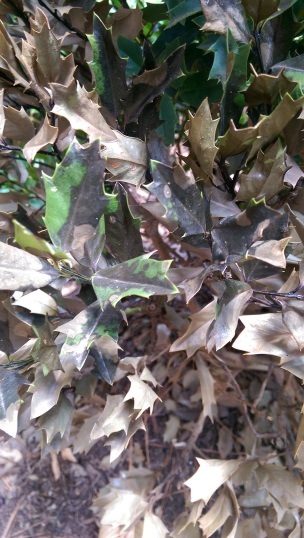 Why did a section of my Holly turn brown & fall off? Why are those Marigold leaves turning white?